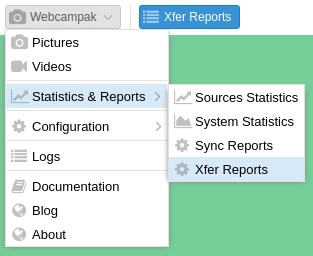 Xfer is the file transfer mechanism available on Webcampak to deserialize picture transmission from picture processing. When Xfer is enabled the system will create transfer job during processing and will place those jobs in transfer queues. The FTP Xfer Reports window provides details about the number of transfer queues and files in those queues. It focuses on jobs currently being processed on the short term. If a Sync job is being processed, this window will only provide partial details and users are encouraged to use the Sync Reports window. The system will regularly clear transfer queues resulting in UUID changing frequently.